From left to right: Bruce Dudley, Ted Ferguson, and Mike Gerbis. The owners of the The Delphi Group – CEO Mike Gerbis, President Ted Ferguson, and Senior Vice President, Bruce Dudley – have been helping organizations buff their green credentials for a couple of decades. But this is more than just a professional gig for them: every year they push themselves to find new ways to go green – both personally and professionally. This has translated into, among other things, purchasing green power and gas from Bullfrog to fuel Delphi operations across Canada, installing solar panels at home, giving 1% of gross sales to charity annually, and going carbon neutral. This year, the management team also introduced a grants program for staff that helps them go greener at home – for example, by installing LEDs or solar water heating. And then there’s transportation. A lot of Delphi staff ride their bikes to work, but that kind of commuting isn’t always possible. So, this year, Ted and Mike got on the EV bandwagon. Bruce had been on the “hybrid” train for a decade, having purchased a Prius with the license plate, “Save Gas.” Ted was first to upgrade, purchasing a Volvo XC90 T8. Mike and Bruce rose to the challenge by trading in their old Fit and Prius for two Chevrolet Volts. 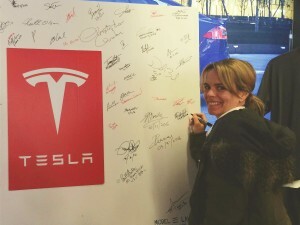 And our intrepid GLOBE COO, Nancy Wright, was one of the first in line to sign up for a new Tesla Model 3. The results? More money in our pockets and smaller carbon footprints, for starters. In one month, the three have combined to save over 500 litres of fuel – the equivalent of more than one tonne of GHG emissions! That’s in addition to comfort and performance that exceeds the previous vehicles, plus lower insurance premiums and future maintenance costs. Regenerative braking on Bruce’s Prius resulted in only one brake change in over 200,000 km. 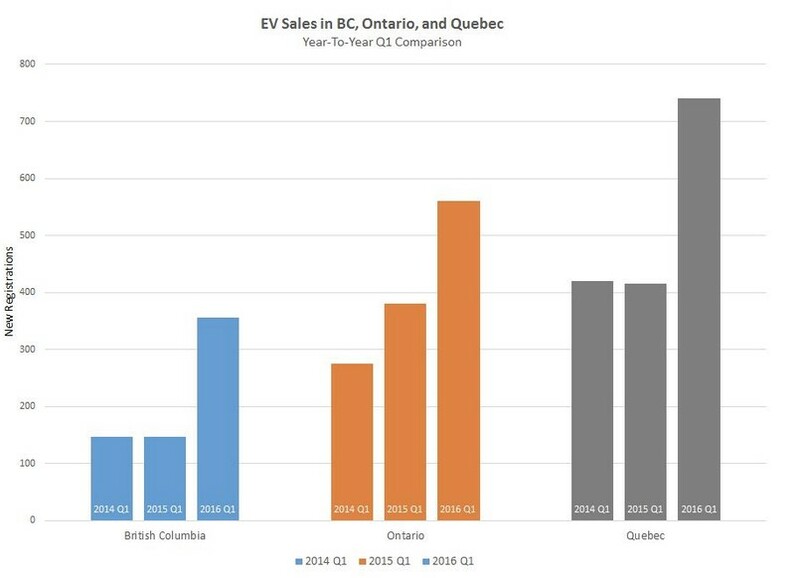 Provincial government incentive programs are providing additional horsepower for those considering switching to EVs (see box below). What’s Fuelling the Global EV Revolution? In 2015, about one in every 150 cars sold in the U.S. had a plug and a battery. But, as echoed in a recent piece in the Wall Street Journal, mass adoption of electric vehicles is coming much sooner than most people realize. Today, electric vehicles typically cost about 25% more than non-electric vehicles. However, costs are likely to continue to decrease because of rapid technological change – and a big leap in battery technology, especially. There’s also the fact that EVs can save drivers about 75% on their fuel costs, and that government incentives will narrow the price gap. Those smartypants analysts at McKinsey have argued that a fully electric car using a $190/kWh battery would be cost-competitive with gas cars using ~$2.50/gallon gasoline. In Canadian, that’s .85/litre. Michael Liebreich, Founder of Bloomberg New Energy Finance, recently wrote a blog about how the electric car revolution will transform the global economy. We’re coming along for the ride.